"Just sending a quick 'Thank you' to Singers for Hire for singing at my wedding on Thursday in the Dunraven Arms Hotel. They were excellent and the highlight of my wedding. My guests were well impressed. Thank you again." Both Fiona and I would like to thank you very much for arranging the surprise singers at our wedding in the Mount Errigal last Saturday. They were simply amazing and we received lots of compliments from our guests about them. They really brought the room to life after the dinner and kick started what was a great night. We would have no hesitation in recommending them to anyone and we hope we see them again at another wedding in the near future. Thanks again. "Just a note to say that you were worth every penny of your fee. You were one of the HIGHEST points of the day, and we are so grateful for your huge input into our wedding day." “The best word of praise I can give is the recommend your singing waiters to all our friends and on every blog I can find”. “You were even funnier than I could have imagined! Our guests had no idea and then when you sang...! Words fail to express how incredible you are”. Just wanted to say thank you. Marco the pizza delivery man was fantastic. All my guests are still talking about him!! Oh my goodness!! Marco & Jean were magnificent! Such beautiful voices! The audience was overwhelmed with their talent! Praises were spoken all through the members. I can not thank you enough. It was truly the anniversary party to remember. What do I say? ....well lets begin with a GREAT BIG THANK YOU for your AMAZING performance at the wedding of my daughter Christine and her husband Shane Byrne on 18th December 2015 in Trim Castle Hotel. You amazed all the guests and they were just blown away with the entertainment. They never stop talking about your surprise performance and even over Christmas people are still saying how they had an amazing wedding and the Opera singers made the day so special and entertaining. Many thanks again and I will be happy to recommend you. The trio were unbelievable, they are the talk of the place and their performance was outstanding, thank you so much for organising everything. Heard this talented fellow sing in Phoenix, Arizona. A one-man show years ago filled with wit and joy. Not a frown or a dry eye in the house. Would love to hear him again. I now live in rural Colorado and we are renovating an historic building for our new arts and events center. Perhaps he will be available to entertain here someday. One can only hope. Just a quick mail to say thank you. The performance on Friday night was brilliant and loved by everyone. The singers were fantastic and it was just the right fit for our event. “Everyone was wondering who the funny waiter was but nothing prepared us for the surprise when you sang. Simply marvellous. Not just funny but quality singing as well”. Dear Nyle (Marco), Many thanks for a fantastic performance on Tuesday night. My mother was totally taken in and adored every minute. All our friends loved you and one or two have asked for your details. It really made the whole evening so special. Best wishes for the future. "Thank you so much for singing for my family on Sunday. I am sure you have been told many times but I will say it again - your voice is truly amazing. You moved everyone in the room to tears. I was so thrilled. Your performance made the day for my parents in law and will be a talking point in our family for many years to come. I really cannot express how much it meant to me personally that you sang. I thank you again, and wish you every success in the years to come." "Just to let you know Joe and Polly were a huge success and we all loved them-there was a queue trying to get Polly's number! Thank you for all your efficiency and hope we will see you all in the future." It's hard to make your wedding different - to give people something new and unexpected. The Singing Chef is that something different and something special. Marco the singing chef was SUPERB - by far THE best decision I made in planning my wedding. The element of surprise is key, so don't tell anyone, just sit back and watch the delight on your guests' faces. Marco and his singing waitress companion had my guests out of their seats, swinging napkins above their heads, singing their heads off! They were BRILLIANT and worth every penny. Book the singing waiters and I guarantee your wedding will be the one everybody talks about for a long time to come. I can't thank you both enough for making our wedding day so special with 'Marco-the singing chef'. Our wedding took place last March in the Meyrick, Galway. The atmosphere created by Marco was unbelievable. People I never saw singing and dancing before, were up out of their seats waving their napkins! The room was alive with energy! Not only could Marco work the crowd but his singing ability was out of this world! It was was mother-in-law's idea to book Marco as she had seen him at a previous wedding. We did not know really what to expect but couldn't have been happier with the result!Everyone was talking about Marco for weeks after, it's what people remember! Thanks again for adding such a special part to our day. Thank you, thank you, thank you Nyle!! What more can say! Only of course that you were fantastic!! It really was one of the highlights of the day, so entertaining, professional and what a voice! The guests really enjoyed it and they were up on their feet singing and dancing. Thank you also for playing along with the groom as he knew nothing about it, he actually thought you were the chef! We had a great laugh the following day as everyone was talking about it, my sister asked did i know what part of Italy you were from, she couldn't believe you were Irish, great accent by the way! Any my neighbour who's daughter is getting married at the Armada next March actually asked David the wedding coordinator if the chef will be singing at their daughters wedding also!! Anyway thanks again, it was the best thing I did booking you, everyone is still talking about it, it made the day! Thank you very much for singing at our wedding - all our guests are still talking about the fantastic singing chef. You were such a surprise and really got our party going. I've already recommended you to a number of engaged friends so hopefully we'll see you again!! I just wanted to get in touch and say a big thanks to Marco for last Wednesday 10th. He was brilliant and everyone was talking about how much of a fantastic surprise he was! I will definitely be recommending him to others and hopefully I can use your services again another time. To Marco, our amazing singing waiter for our wedding on June 11th.... A huge thank you for an outstanding performance...you were a huge hit with the guests... People are still raving about it... No doubt further bookings will come your way as a result as were many soon to be married couples present! Thank you so much again! Truly was a highlight of the day ! All our guests are still talking about the day and how they couldn’t fault a thing. They so enjoyed Nyle’s performance and couldn’t believe how I got him. We’re still meeting people and the first comment they make is about the singing waiters! And it was brill to have them straight after the meal as it woke everyone up and from there; they were on the dance floor all night! Thanks again for everything! Just a quick email to say a hug thank you for entertaining us & our guests on our wedding day in Bantry last April. I really cannot recommend singers for hire enough especially Marco the Pizza Delivery Guy;) From start to finish Marco had all 270 people at our reception dancing & singing along with him. Here are a few pics the photographer sent us we thought you might like to see. Feel free to use the pics on line or for prospective bookings. Thank you so much for yesterday, it was a triumph. everyone thoroughly enjoyed the singing & the whole experience we are still on a high today. Thank you so much to the 3 singers who performed at my wedding in Dunmore House last Friday. They were absolutely amazing. Unbelievable singers. They really got the crowd going, all were up and dancing around. All my guests were asking who they were and we're saying how amazing they were. I would highly recommend singersforhire. Really added something special to my already amazing day. "We wanted to thank you so much for singing at our wedding reception on 16th March 2010 in Tankardstown House. Your performance far exceeded our expectations and it was the talk of the night. So much fun with an incredible voice. Everybody loved you. Thanks again you made our reception very memorable." Thank you so very much for your performance on Friday. Suffice to say we absolutely LOVED it! The feedback was phenomenal re the pizza man! Tip top quality entertainment!! Hopefully we can think of a reason to get you again! On behalf of all associated with Milford Care Centre, I would like to sincerely thank you for attending our Coffee Morning. The event was a huge success and it truly was appreciated that you gave of your time not to mention the wonderful performances you gave. It certainly made our day and of course some of the attendees were thrilled when you serenaded to them. There were great memories made on the day and for which we are very appreciative. Thank you so much for entertaining us and hope you would perform for us again in the future. Nyle, you absolutely blew everyone away with your wonderful performance. It was the one of the biggest highlights and the one thing every single person mentioned-'Genius', 'I could haven listened to him all night', 'He got everybody going'... it goes on. William and I throughly enjoyed every moment, it had us both grinning from ear to ear- especially seeing everyone's reaction when you started to sing. You are such an amazing talent! Riah, thank you for your help throughout the booking process, you were great! My sincere thanks to you for providing such a wonderful night’s entertainment on Saturday in Tipperary Golf Club. The feedback is terrific and the compliments are flying since! You made it a night to remember, and as I said on the night, thank you for giving so generously of your wonderful talent and precious time. Tell Riah to enjoy the flowers! Thank you so much for the fantastic entertainment on the day - everyone was in shock and totally enjoyed your performance, mind you it was such a hard secret to keep, but thank you so much we really enjoyed ourselves. Just a note to thank you so much for your wonderful performance at our wedding on Monday 3rd August in New Forest Tyrrellspass. Everyone absolutely loved it and are all still raving about it. With such a small wedding everyone got involved and it really added to the party atmosphere and celebrations. My 5 year old niece even said it was her most favourite thing about the whole wedding.....now that's a compliment! Thanks again for providing top class entertainment, you helped make it a day which we will never forget. Wishing you continued success. Hope you and the team are all well!! Just wanted to say a big thank you to Joe and Paula again for making Becky & Ty's wedding even more special. Everyone enjoyed them very much and are still talking about it. Their voices are superb!! Just want to say thanks so much to the two guys who performed at our wedding last Friday as the security guards! Absolutely fantastic, they get everyone's curiosity going and delivered an amazing performance! They were the talk of the night and still are a week later! Would recommend them to anyone who wants to add something special and fun to their day! Dear Marco, We wanted to drop you a few lines to thank you for your fantastic singing performance at our wedding breakfast on 23rd June at Tylney Hall Hotel. Kevin for certain will forever remember you standing in the room, observing events in your waiter’s outfit with everyone enjoying themselves and none the wiser to your presence. From the moment you started, the room broke from the “quiet family celebration” we had told everyone to expect to the party we really desired – brilliant! We do hope we get to see you perform again. Just a huge thank you for making our day so memorable – we can’t thank you enough and thoroughly enjoyed your entire performance. Just wanted to thank you for providing such a wonderful performance for us on Saturday, it was amazing and Vince loved it. All his fav opera pieces. My 3 yr old great nephew was in awe of the show and wanted to know why the lady chef wasn't there to sing to him at breakfast next morning ! Thank you again. We just want to drop you a short note to express our thanks for a brilliant performance by the singers at our recent wedding in the Old Ground in Ennis. We had a great day and the singers made it that extra bit special. The best bit for us was watching the faces of the people who hadn’t a clue that this was going to happen. Mary’s mum thought the hotel had provided it as a service! Everyone to a person was raving about the 3 lads especially the girl Joan. One couple who attended the day run a local catering company and I believe they may have gotten a card from the lads. I hope they did and that you can end up working together. Please pass on our gratitude to all concerned and thanks again for your patience with me during the organisation of this. Riah, Just a short note to thank Marco it was fantastic and he lifted proceedings just when people were getting a little tired. Not only is Marco a great singer but a great actor to boot and by god did he work the room. Continued success and Best wishes for Christmas already !!!! Frank & Mikey. We just wanted to say a huge Thank you for an amazing performance which we and all of our guests will never forget. We had been looking for something a bit different for our wedding to be a talking point and something that would wake up our guests after a heavy dinner and you most definitely delivered. All our guests have not stopped raving about the show. You made it so easy to book you and to trust you knew what we wanted. Extremely professional and better than we ever could have anticipated. It was also great for us aseventhough we knew you were coming, (we were the only people who did) but we didn't really know what to expect and we couldn't have had been happier. Booking you was money very well spent. We will be recommending you to everyone looking for a crowd pleasing, memorable performance in the future. All the best to you and the team. Danny and I wanted to pass on our thanks for Marco's fantastic performance at our wedding on Friday 13th July. The performance was totally unexpected for all of our guests and it certainly received the reaction that we were hoping for! Many of the guests commented that they had never been to a wedding where they were standing singing on their chairs after the main course and it was without a doubt, a highlight of the day! It created an electric atmosphere for the remainder of the dinner and evening and we can't thank you enough! 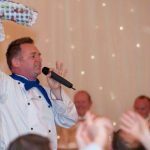 A Big Thank You for the amazing performance of the Singing Chef at our wedding in The Ormonde Hotel, Kilkenny. The chef really took our guest by surprise (some even commented that they thought it was a lovely touch that the chef came out from Kitchen to wish us well). From the moment he started singing he blew us all away and he really got the wedding party off to a great start. Thanks again and continued success with your performance. I just wanted to email you to thank you so much for doing such a great performance at our wedding on 8th October. We and our guests enjoyed every minute, you're not only a very talented singer but a great comedian too! Your performance was the part of the day that we got most compliments and comments on, the guests all got such a surprise.We will be sure to recommend you to our friends. Please feel free to use this email as a testimonial. Thanks again! So you know how it’s a long oul day and guests are starting to flag a little by the end of the meal...not a bit of it if you’ve hired the jaw droppingly brilliant Marco and mates! Singers for Hire were the only wee secret we kept up our sleeves on our big day. We didn’t even tell our best man and so when the ‘Chef’ came out and started telling my wonderful groom off for not finishing his mash potatoes my bridesmaids had to look away for fear they were going to embarrass themselves with laughing at the audacity of such an opinionated cook. A very short while later the singing began and the look on our guests faces around the room was something neither of us will ever forget. Everyone was immediately up for it and the entire room of 156 guests young and old were soon waving their napkins and singing ‘just one cornetto’ then congo-ing round the room behind Marco’s rousing lead. It was truly amazing and got everyone completely in the mood for the speeches and party. If you’re wondering about whether these guys are worth the money or good enough, wonder no more! They couldn’t have done enough for us, were a joy to deal with from day 1 and are some of the best entertainers I’ve ever come across in my arts career. Thank you Singers for Hire for adding the wow to our wedding. You rock! Emma and Rob. Married NYE 2012 at Markree Castle, Sligo. Can you please pass on my thanks to the 3 singers on Friday night – they are very professional and as I am sure they will have noted themselves were well received. The napkins were flying and all giving their best voice. I want to thank you so very much for such a great performance. Everyone I spoke to was so impressed with the level of your voices and the original performance. It really was very special. I am sorry I was so hectic, thank you for making my life so easy! Thanks for the 2 wonderful singers. They went down great and everyone got involved. A huge thank you for your excellent performance on our wedding day it was fantastic everybody said it made the meal !! We got the DVD yesterday and it was so good to see it all over again you really are brilliant and thanks so much for making our wedding day memorable we so enjoyed it as all of our guests. “Thank you for such wonderful entertainment. It was the best surprise ever!”. Just a quick email to say thank you for the good wishes and your great performance on the 25th!! It was absolutely fantastic and people are still talking about it. I believe a few people tried to book him afterwards! The chef was definitely a highlight of the day and he was so good we had to convince people that (a) he wasn’t the chef and (b) he wasn’t miming!!! The day was fab, and the stories are growing legs at this stage. “Such a great idea and so well executed. When you held the shaving foam up to Don’s face I thought he was going to die laughing!”. Just a quick email to say thanks to Marco and his ex-wife for a wonderful performance at our wedding. Every one of our guests we have spoken to were blown away by the performance, as were we. The performance was truly amazing and for most of our guests it was the highlight of the day. It really was magical and we never imagined the performance could be as wonderful as it was or that the guests would enjoy it as much as they did. Young and old, male and female all loved every second of the performance. Thanks again for everything. The performance last night was excellent. We managed to keep it top secret so a lot of people were genuinely confused, Marco of course was hilarious. Would highly recommend!! Thank you. Bernie. Hi, We just want to say a huge thank you to you for such an entertaining act at our wedding on 13th April. 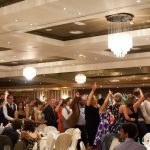 The look on our guests faces were priceless, we looked down the room and you could such fun being had by all, you got every one up on their feet and it set the tone for the rest of the night. Even the staff at the hotel were asking all about you guys and said how they had never had such entertainment there before for a wedding. Couldn't recommend you enough, and you were a pleasure to deal with. I just wanted to drop you a quick note to say that Marco was brillant on the night of our wedding he really took our guests by surprise ( in a good way ) and really set the tone for the remainder of the evening. He went down a treat - that xmas jumper is just priceless...He was the talk of the wedding for days after so thanks again for making our day extra special. I will deff be recomending Marco to friends and family going forward. "I just wanted to get in touch to say a massive thank you for all your performances in Dublin. The feedback was brilliant and the client is extremely happy so thank you! I hope you enjoyed yourself also"
Just wanted to send a quick email thanking Marco for making my sister and her husband's wedding day so memorable! Marco did an amazing job in entertaining us and all our guests at a time which was perfect. I would highly recommend Marco for a wedding or any other special occasion! Thanks again for performing at our wedding. You certainly broke the ice and made the crowd laugh and go mad... you certainly came across very, very well and we would hope to use you again at another big function. I would just like to say that the entertainment which you provided last night at our corporate night was outstanding. I have received many emails today all of which have complimented the entertainment. Once again thank you for making my evening a success. "Bonjour Monsieur le Chef! My phone line is still resounding with calls from the captivated guests at Hayfield Manor on Thursday last. They were absolutely enthralled with your dramatic entrance, your excellent singing and your vibrant personality. You are really so gifted with your charm and charisma. I believe you were even propositioned by an octogenarian!! Thank you so much for such a wonderful performance." Hi, Just wanted to thank you so much for orgainising Marco to sing at our wedding, it was brillant! it was an amazing experience and everybody loved him!! It was a nice surprise for me as well as I had kind of forgotten about him as the day was sooooo hectic haha. I would recommend him to everyone! !